From Sunday 25th May until Wednesday 28th May we need volunteers to help us gather plants and landscaping materials from the show gardens for redistribution. Not only will this directly benefit communities across the Capital but this year we expect the scheme to divert over 300 tonnes of waste from landfill. All this has to be accomplished over a four-day period and we can only achieve it with the help of a small army of willing volunteers. We'll be sharing the site with hundreds of contractors dismantling the award-winning garden exhibits and you'll be part of our team, racing against the clock to salvage as much as possible in the days after the show closes to the public. This is a unique volunteering experience packed full of energy and excitement! To register your interest contact Fabiola at [email protected] indicating the dates you'd like to volunteer. Please note, places are limited and will be assigned on a first come, first served basis. Edible High Road- Fruity Day for Forest Hill! Saturday's launch of the Forest Hill and Honor Oak Edible High Road was a huge day! Started early with 7am tree deliveries. It was the result of several months planning, hundreds of emails and calls and an awful lot of work. The Forest Hill Society Project Team- stalwart Quetta and the deeply practical Alisa. Chair Richard and Deputy Chair Michael. Our invaluable Honor Oak contact, Brett. Jenny Clutten, local Lewisham Councillor and a master poster designer in her spare time! Shannon's Garden Centre whose fantastic family firm stepped up to work with us! The Holy Trinity Primary School and Head teacher. The 50 local businesses who bought trees, photocopied and printed bits and bobs! The volunteers who potted up trees and planted up herbs. Volunteers who made scores of visits to shops all over SE23 to introduce the project to staff and managers, accept payments, deliver posters, Trail Maps and finally turn up at 7am to deliver trees! On Sunday 19th May 2013, BBC Radio 4ʼs Gardenersʼ Question Time records a programme with The Chelsea Fringe at Hoxton Hall, London. The celebrated panel of gardening experts will be tackling questions put to them by local gardening enthusiasts. Gardenersʼ Question Time is a Radio 4 institution, attracting over 2 million listeners a week. Recorded in a different location each week, this long-standing radio programme has answered well over 30,000 questions since its inception in 1947. The panel NEVER see the questions before the recording. Their encyclopaedic, seemingly effortless answers are completely spontaneous and reveal their hugeexperience and depth of gardening knowledge. Being on the GQT panel is not for the faint hearted! On the panel will be: Bunny Guinness, Bob Flowerdew and Matthew Wilson with Eric Robson in the chair. Please email [email protected] with CHELSEA FRINGE in the subject line. If you are successful you will receive a confirmation email within a few days. This will include further details about the recording. 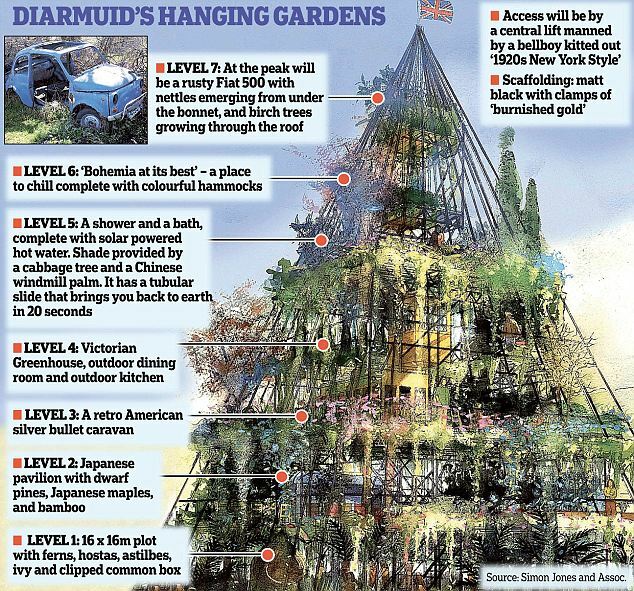 Chelsea Preview: Diarmuid Gavin's Hanging Gardens! After last year's levitating 'pink eye in the sky' which the public couldnt ride up, Diarmuid Garvin has come up with another showy but ultimately daft and inaccessible garden. Its a pyramid of scaffolding poles 7storeys high with a garden on every level. Gavin says the 80ft-high garden was inspired by the Hanging Gardens of Babylon. Im trying not to pre-judge! Why do the RHS indulge him?! These Celsea gardens are meant to be inspirational rather than aspirational- after all they each cost the price of a house in London. But surely some link to what can be produced in a home garden setting has to be maintained? There is a quote from a professional gardener in the accompanying article, and there aren't many who would disagree with it!. This Fiat 500 will top out the Garden Tower. 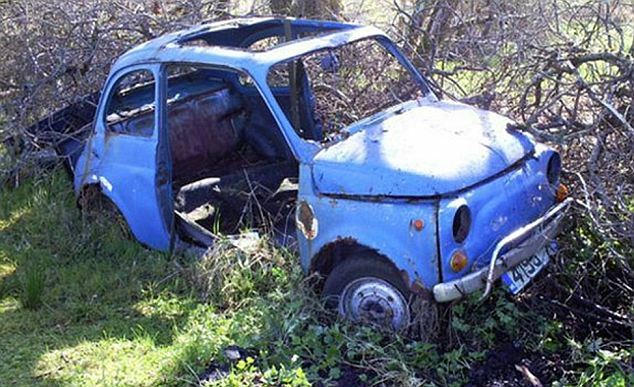 Perhaps if he saws the Fiat in half, Gavin will also get a show at the Tate! Its's such a statement garden, anything less than Best In Show will be seen as a humiliation. Plus he is such a sulky character, he''d probably slope off for another 7 years like he did last time he didnt win Gold ! What Im REALLY looking forward to is Andy Sturgeon lastest opus. Now he really is a design and planting genius ! The Crown Jewel of gardening events takes place on May 22-26. I cant wait! Ive loved Diarmuid Gavin for a long time now and was delighted that he won last year's best in show. I love the show gardens and the Great Paviliion, but my favourites are the smaller Coutyard Gardens. Does everyone love it as much as me?